THIS IS THE SECOND PAGE OF DOCUMENTS FOR THE SECOND HALF OF 1932 on Nicaragua's Caribbean Coast region , housing documents dated during the 92 days from October 1 to December 31. And so the year 1932 ends with a whimper, as the EDSN effectively ends its military campaigns in the Caribbean Coast region after mid-July. 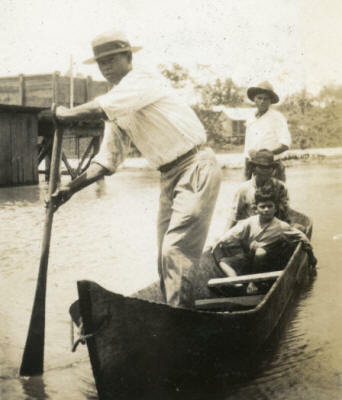 The region’s quiescence stands in sharp contrast to the tumultuous conditions in Las Segovias, the Honduran borderlands, and much of León and Chinandega departments, where Sandino's forces are extremely active and sympathies for the EDSN run deep among the poor and working classes. But in the bigger picture, for the EDSN, the Battle for the Coast is lost. There is no need to hypothesize that the Miskitu transformed their memories in the decades after the 1930s to recast the rebels as outlaws & bandits, as creatively proposed by Charles Hale (1994). There is ample evidence in these pages that in the time of Sandino, many Miskitu & Creoles on the Coast felt indifference or hostility toward the EDSN. There are few more powerful testaments to this sentiment than the above-cited petition and the genre to which it belongs. And so the 6-plus year U.S. military occupation of the Caribbean Coast comes to a quiet end. And now Sandino and his Sandinistas need to figure out what to do next.
" [p. 1] . . . LOCATION OF THE ENEMY ELEMENTS. ¶ . . . [NOTE: Of the 24 EDSN chieftains surveyed in the first 5 pages, none are in the Eastern Area] . . . [p. 5] UNITS IN CONTACT: ¶ [NOTE: Of the 17 military contacts during the month, none were in the Eastern Area] . . . [p. 7] STRENGTH AND MOVEMENTS ¶ . 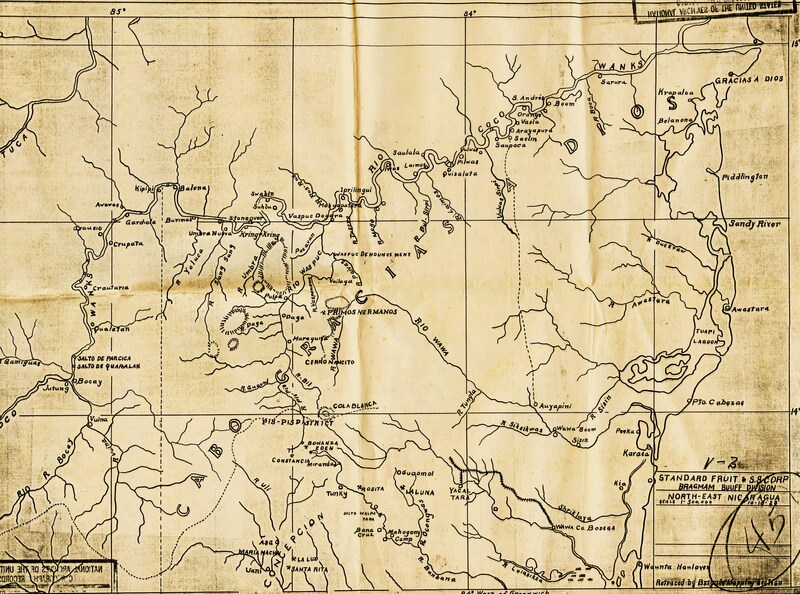 . . [p. 8] Sept 8– Group of 60 bandits reported at Sacklin on Coco River, Dept. Northern Bluefields. [NOTE: Of 37 items in this category, this is the only one in the Eastern Area.] ¶ . . . [p. 16] WEEK ENDING SEPTEMBER 12. ¶ . . . GENERAL INFORMATION. ¶ . . . Reports from Northern Bluefields indicate confirmation of report that Simeon Gonzalez died of wounds. ¶ . . . ESTIMATE. ¶ . . . [p. 18] No invasion of any large bandit group is expected in Northern Bluefields, but a foray of small unorganized groups may be expected most any time along the lower Coco River or even a raid on one of the Commissaries along the Standard Fruit Co. railroad if the bandits believe they can successfully accomplish it without encountering Guardia patrols. ¶ Southern Bluefields and other southern departments excluding Leon and Chinandega should remain quiet. ¶ . . . . [p. 19] WEEK ENDING SEPTEMBER 19. ¶ . . . [p. 21] ESTIMATE. ¶ . . . The Eastern Area and Southern Department, (less Leon) should remain quiet. ¶ . . . [p. 24] WEEK ENDING OCTOBER 3. ¶ . . . [p. 25] ESTIMATE. ¶ . . . Eastern Area gives no indications of bandit activities in the coming week. ¶ . 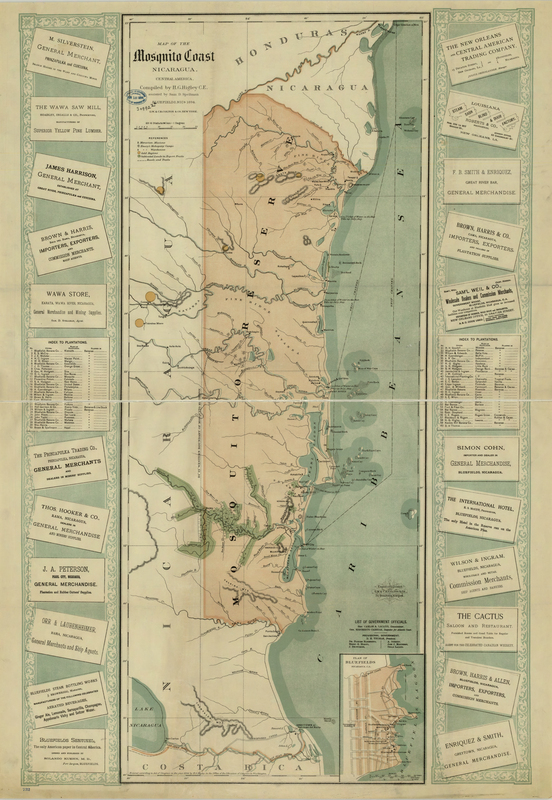 . . [p. 33] CONSOLIDATED REPORT OF CONTACTS OF THE GUARDIA NACIONAL FOR THE MONTH OF SEPTEMBER 1932 [NOTE: Of 17 military contacts, none were in the Eastern Area]." Report on the death of raso Ramsoy, Thomas #2826, which occurred in Bacan, Prinzapolka River, at 9:50 a.m., 2nd Lt. E. Rourk A., Wuani, p. 1. "1. At 2:00 p.m. Lt. Singletary along with Wing Long, reported without arms nor shoes, reporting that at Bacan, on the Prinzapolka River the outboard motor in which he and four enlisted were coming [coming] capsized as they were passing the Fall of Bacan. All the passengers were in grave danger of their lives and went ashore with great difficulty with exception of raso Ramsey, who wasn’t seen any more after the boat had capsized. They all lost their arms and ammunition including all parts for the radio. Lt. Singletary ordered Sgt. Garth and two enlisted to stay in Bacan until rasa Ramsey appeared and to wait there until a detail of guardias from Wuani arrived. 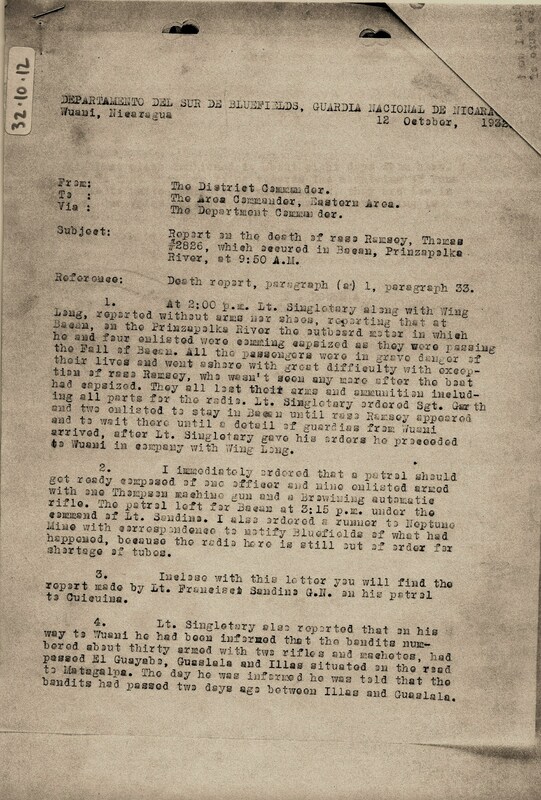 After Lt. Singletary gave his orders he proceeded to Wuani in company with Wing Long. ¶ 2. I immediately ordered that a patrol should get ready composed of one officer and nine enlisted armed with the Thompson machine gun and a Browning automatic rifle. The patrol left for Bacan at 3:15 p.m. under the command of Lt. Sandino. I also ordered a runner to Neptune Mine with correspondence to notify Bluefields of what had happened, because the radio here is still out of order for shortage of tubes. ¶ 3. 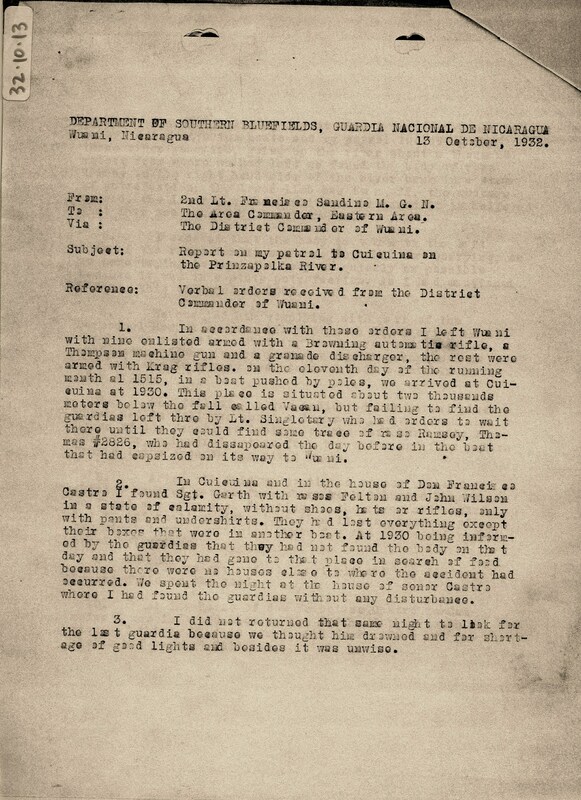 Inclose with this letter you will find the report made by Lt. Francisco Sandino G.N. on his patrol to Cuicuina. ¶ 4. Lt. Singletary also reported that on his way to Wauni he had been informed that bandits numbered about thirty armed with two rifles and machetes, had passed El Guayaba, Guaslala and Illas situated on the road to Matagalpa. The day he was informed he was told that the bandits had passed two days ago between Illas and Guaslala. . . ."
Report on the death of raso Ramsoy, Thomas #2826, which occurred in Bacan, Prinzapolka River, at 9:50 a.m., 2nd Lt. E. Rourk A., Wuani, p. 2. ". . . This last place mentioned is about eight days from here. I believe that they are going towards the mountains of Pena Blanca to unite their force with Pedron, they are low in arms. Our spies have brought us news that everything is quiet. ¶ E. ROURKE A. ¶ 2nd. Lt. G.N." 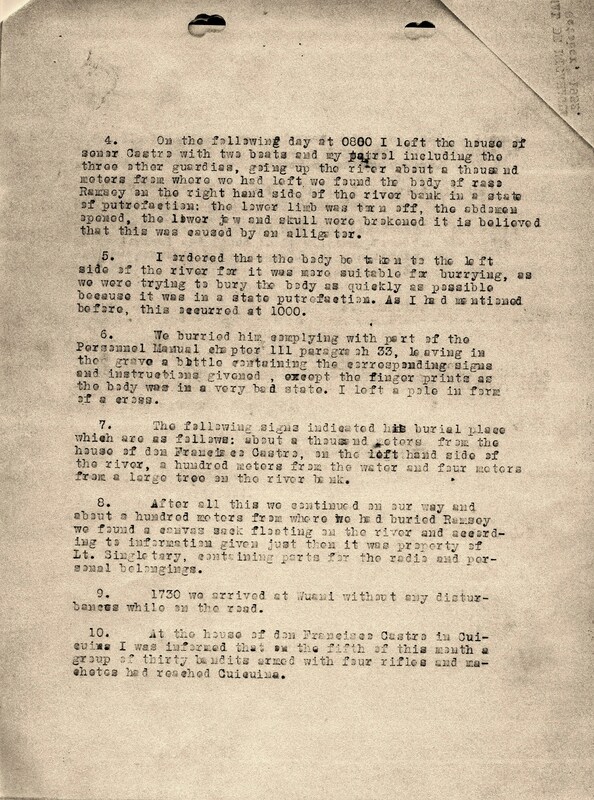 Report on my patrol to Cuicuina on the Prinzapolka River, 2nd Lt. Francisco Sandino M. Wuani, p. 1. "1. In accordance with these orders I left Wuani with nine enlisted armed with a Browning automatic rifle, a Thompson machine gun and a grenade discharger, the rest were armed with Krag rifles. On the eleventh day of the running month at 1515, in a boat pushed by poles, we arrived at Cuicuina at 1930. This place is situated about two thousands meters below the fall called Vacan, but failing to find the guardias left there by Lt. Singletary who had orders to wait there until they could find some trace of raso Ramsey, Thomas #2826, who had disappeared the day before in the boat that had capsized on its way to Wuani. ¶ 2. In Cuicuina and in the house of Don Francis Castra [Francisco Castro] I found Sgt. Garth with rasos Felton and John Wilson in a state of calamity, without shoes, hats or rifles, only with pants and undershirts. They had lost everything except their boxes that were in another boat. At 1930 being informed by the guardias that they had not found the body on that day and that they had gone to that place in search of food because there were no houses close to where the accident had occurred. We spent the night at the house of señor Castro where I had found the guardias without any disturbance. ¶ 3. I did not return that night to look for the lost guardia because we thought him drowned and for shortage of good lights and besides it was unwise. . . . "
Report on my patrol to Cuicuina on the Prinzapolka River, 2nd Lt. Francisco Sandino M. Wuani, p. 2. " . . . 4. On the following day at 0800 I left the house of senor Castro with two boats and my patrol including the three other guardias, going up the river about a thousand meters from where we had left we found the body of raso Ramsey on the right hand side of the river bank in a state of putrefaction: the lower limb was torn off, the abdomen opened, the lower jaw and skull were brokened it is believed that this was caused by an alligator. ¶ 5. I ordered that the body be taken to the left side of the river for it was more suitable for burying, as we were trying to bury the body as quickly as possible because it was in a state putrefaction. As I had mentioned before, this occurred at 1000. ¶ 6. We buried him complying with part of the Personnel Manual chapter 111 paragraph 33, leaving in the grave a bottle containing the corresponding signs and instructions given, except the fingerprints as the body was in a very bad state. I left a pole in form of a cross. ¶ 7. The following signs indicated his burial place which are as follows: about a thousand meters from the house of don Francisco Castro, on the left hand side of the river, a hundred meters from the water and four meters from a large tree on the river bank. ¶ 8. After all this we continued on our way and about a hundred meters from where we had buried Ramsey we found a canvas sack floating on the river and according to information given just then it was property of Lt. Singletary, containing parts for the radio and personal belongings. ¶ 9. 1730 we arrived at Wuani without any disturbances while on the road. ¶ 10. At the house of don Francisco Castro in Cuicuina I was informed that on the fifth of this month a group of thirty bandits armed with four rifles and machetes had reached Cuicuina. . . . "
Report on my patrol to Cuicuina on the Prinzapolka River, 2nd Lt. Francisco Sandino M. Wuani, p. 3. " . . . 11. After I was informed about the bandits I went to see the rest of the people living there to make sure of such rumors but no one assured me of the rumors. ¶ 12. At my arrival at Wuani I reported all that had occurred to the District Commander. ¶ 13. We opened the bag that was found on the river on my arrival and found in it all parts for the radio and the personal belonging of Lt. Singletary. 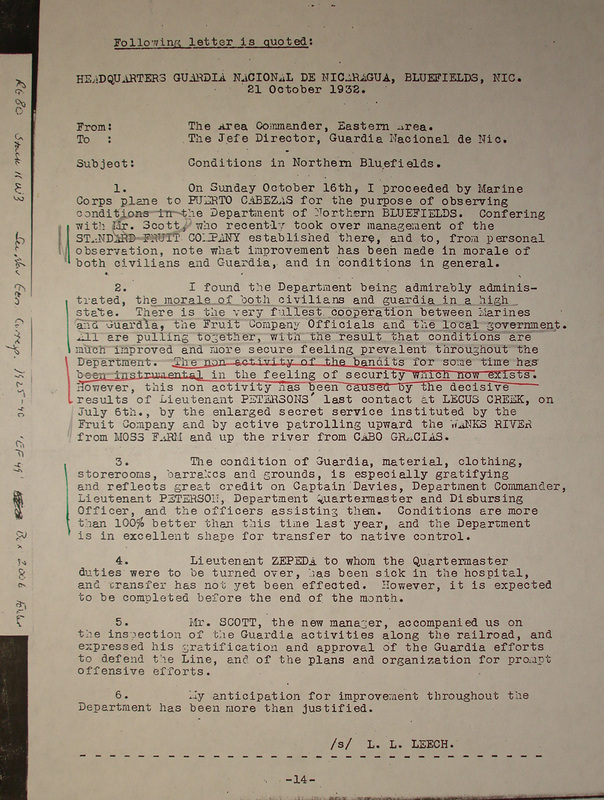 ¶ F. Sandino"
Conditions in Northern Bluefields, Col. L. L. Leech, Bluefields. "1. On Sunday October 16th, I proceeded by Marine Corps plane to PUERTO CABEZAS for the purpose of observing conditions in the Department of Northern BLUEFIELDS. Conferring with Mr. Scott, who recently took over management of the STANDARD FRUIT COMPANY established there, and to, from personal observation, note what improvement has been made in morale of both civilians and Guardia, and in conditions in general. ¶ 2. I found the Department being admirably administrated, the morale of both civilians and guardia in a high state. There is the very fullest cooperation between Marines and Guardia, the Fruit Company Officials and the local government. All are pulling together, with the result that conditions are much improved and more secure feeling prevalent throughout the Department. The non activity of the bandits for some time has been instrumental in the feeling of security which now exists. 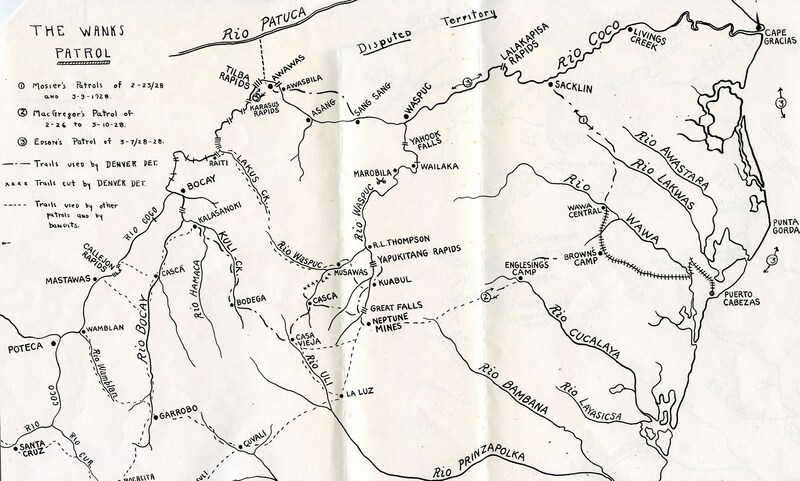 However, this non activity has been caused by the decisive results of Lieutenant PETERSONS’ last contact at LECUS CREEK, on July 6th, by the enlarged secret service instituted by the Fruit Company and by active patrolling upward the WANKS RIVER from MOSS FARM and up the river from CABO GRACIAS. ¶ 3. The condition of the Guardia, material, clothing, storerooms, barracks and grounds, is especially gratifying and reflects great credit on Captain Davies, Department Commander, Lieutenant PETERSON, Department Quartermaster and Disbursing Officer, and the officers assisting them. Conditions are more than 100% better than this time last year, and the Department is in excellent shape for transfer to native control. ¶ 4. Lieutenant ZEPEDA to whom Quartermaster duties were to be turned over, has been sick in the hospital, and transfer has not yet been effected. However, it is expected to be completed before the end of the month. ¶ 5. Mr. SCOTT, the new manager, accompanied us on the inspection of the Guardia activities along the railroad, and expressed his gratification and approval of the Guardia efforts to defend the Line, and of the plans and organization for prompt offensive efforts. ¶ 6. My anticipation for improvement throughout the Department has been more than justified. ¶ (signed) L. L. LEECH"
Report & Mosquito petition. D. M. Ferguson, Representative of the Mosquito Indians and Creoles of the Mosquito Reservation of Nicaragua, to British Foreign Minister, p. 1. "I think we should formally acknowledge receipt, and send correspondence with copy of petition, to Managua and Guatemala. P. Mason"
Report & Mosquito petition. D. M. Ferguson, Representative of the Mosquito Indians and Creoles of the Mosquito Reservation of Nicaragua, to British Foreign Minister, p. 2. "May it please Your Excellency, and our most Honourable Government. ¶ We the Mosquito Indians and Creoles of the territory known as the Mosquito Reservation, of Nicaragua, extending from the Wangka River to Grey Town, a distance of about three hundred and fifty miles, but which has been incorporated since 1894 in the Republic of Nicaragua, beg to approach Your Excellency and Government on a matter of extreme vital importance which concerns us as a people and our beloved country, the Mosquito Coast, praying that Your Excellency and Honourable Government will kindly intervene and adjust this affair for us so that we may enjoy the rights, privileges and advancements, as are being enjoyed by modernized countries and peoples of the world. ¶ We are convinced and are quite sanguine that the British Government which is the most powerful in the world, and one which stands for justice, equity, love, liberty and advancement, both educationally, commercially, and industrially, will impartially give our grievance as set forth, Your most earnest and diplomatic considerations, and act accordingly on our behalf, so that we receive those things, which by international laws are our rights and privileges. ¶ In consequence thereof we respectfully beg to make the following authentic statements: ¶ 1. Be it known that we the Mosquito Indians were a free and independent race from before the advent of Christopher Columbus to the Western World in 1492, having our own form of Government and ruled by the Kings. ¶ 2. That is was the Mosquito Indians who befriended the Great Discoverer and helped him in his sad predicament when he landed at the place now named Cape Gracias a’ Dios. ¶ 3. That in the early part of the seventeenth century, one of our Kings Jeremy by name, went to Jamaica, British West Indies to the Duke of Albemarle then Governor of the Island and prayed that his country the Mosquito Coast be taken under the protection of the English Government, as he the King Jeremy feared that Spaniards who were now swarming to the Western World, which request was granted. ¶ 4. That we Indians and our beloved country, the Mosquito Coast, remained under England’s protection until the year 1860. When on the 28th of January of the same year (1860), a treaty called the Treaty of Managua was made between the British . . . "
Report & Mosquito petition. D. M. Ferguson, Representative of the Mosquito Indians and Creoles of the Mosquito Reservation of Nicaragua, to British Foreign Minister, p. 3. ". . . Government and the Republic of Nicaragua, by which our country, The Mosquito Coast, was placed under the protection of the Republic of Nicaragua, we are still having reserved to us our rights and privileges of self-government having our own rules whose title was then reduced to that of Chief. ¶ 5. That these above mentioned conditions continued until on the 13th of February 1894, when the Nicaraguan Government overthrew the Mosquito Government and seized our country by force of arms, thus violating the Treaty of Managua. ¶ 6. That our Chief Robert Henry Clarence was by existing conditions forced to seek refuge in the Island of Jamaica B.W.I. where he remained until he died. ¶ 7. That to make sure of having our beloved country more firmly in its deadly grasp, and probably to vindicate and establish his rights of ownership, the Nicaraguan Government called delegates of Indians from the various villages to Bluefields and by sweet words and glorious promises together with the free distribution of intoxicating liquors drew up a document called the Mosquito Convention to which the Nicaraguan Government caused the Indians to affix their names. (Copy of Mosquito Convention enclosed). ¶ 8. That thirty five years have passed since the signing and putting into effect this solemn law and covenant, the Mosquito Convention, but not one of its decrees contained therein has been lived up to by Nicaraguan Government. That the Nicaraguan Government has totally disregarded the Decrees of the Mosquito Convention and therefore has forfeited all rights and privileges to our country as set forth in the said document the Mosquito Convention. ¶ 9. That in spite of the fact that millions of dollars have been collected as revenues in the Mosquito Coast the Custom dues alone aggregating about Thirty-Three Million Dollars. Absolutely nothing has been done by the Nicaraguan Government for the benefit of our country, the Mosquito Coast; and we the inhabitants, the Mosquito Indians. ¶ Art. 2. says—All the revenue produced in the Mosquito Litoral shall be inverted in its own benefit. The revenues have not been inverted for the benefit of the Mosquito Litoral. ¶ Art. 3. That the Mosquito Indians have been forced to bear arms and fight and to do other military services. ¶ Art. 4 That taxes have been imposed on the Mosquito Indians which they the Indians were compelled to pay. ¶ Art. 5 That the rights of suffrage has not been extended to women. ¶ Art. 6 That the post of Inspector has not been held by any Mosquito Indian, except one; and that is very recently. That the post of Inspector has been always in every place held by a Nicaraguan Spaniard, styled the “Commandante” whose only desire was and is to inflect heavy fines for the most trivial offences; most of . . . "
Report & Mosquito petition. D. M. Ferguson, Representative of the Mosquito Indians and Creoles of the Mosquito Reservation of Nicaragua, to British Foreign Minister, p. 4. " . . . which (fines) went into his own coffers. ¶ 10. That in consequence of the non-fulfillment of the Decree of the solemn law and covenant: the Mosquito Convention by the Nicaraguan government we the Mosquito Indians declare that this document the Mosquito Convention becomes null and void and the act of incorporation annulled. ¶ 11. That we Indians being utterly unable to fight for our rights and could never think of raising up in arms against the Nicaraguan Government being extremely powerless so to do. ¶ 12. And that realizing that our beloved country and ourselves are practically going to ruin, and desiring for ourselves and children and the generations to come the blessings and privileges now enjoyed by modern civilized countries. ¶ 13. And that our heart felt desire now is to be released from the yoke of the Nicaraguan Government, who has deliberately and openly before the world, disregarded and discountenanced the Decree of the solemn law and covenant, the Mosquito Convention which they drew up and signed. ¶ 14. That of this present crisis when the Bandits are killing, robbing and ill-using our women in a most disgraceful manner, and our country is in a most disturbed position; when there is no right protection afforded us for life and property, the Spaniards having overrun our country and we are ill-used and ill-treated and killed. We now more than ever are convinced that the time is now opportune that it is incumbent that our country be again restored to us. ¶ Therefore in consequence of what has been said, we the Mosquito Indians and Creoles are now praying that Your Government separate our country the Mosquito Coast from Nicaragua, and restore to us our country. That we will have the British form of Government independent and free from the Nicaraguan Government. ¶ 14. Therefore we humbly pray that Your most esteemed and Honourable Government will intervene for our poor Indians behalf and take up the matter with the Nicaraguan Government and adjust same so that we the poor Indians may receive our rights as are put forth in our dispatch to the Nicaraguan Government. ¶ 15. We may here mention that our country has vast resources; but requires development. ¶ A. There is abundance of gold, silver, and copper and oil. ¶ B. There are waste tracts suitable to rice cultivation from which millions of bushels of rice could be harvested each year. ¶ C. There are waste tracts of savannahs very suitable for the cultivation of cotton. ¶ D. Our forests abound with rubber, pine, mahogany and cedar. ¶ E. That our soil is well adapted to the cultivation of pine-apples, bananas and citrus fruits. . . . "
Report & Mosquito petition. D. M. Ferguson, Representative of the Mosquito Indians and Creoles of the Mosquito Reservation of Nicaragua, to British Foreign Minister, p. 5. " . . . 16. That had not the Bragman’s Bluff Lumber Company an American Concern come to this country and started operations in Lumber and bananas by which we have procured work, our condition would be most deplorable. ¶ 17. Can we engender the hope that in the near future we and our country be under the protection of Your Honourable Government? Should that be, then already we see with our mind’s eye, beautiful towns with the latest of modern fixtures, schools and colleges, law and order; our country teaming with companies, factories, and workmen, and above our heads flowing in the breeze the:- "FLAG OF JUSTICE, FREEDOM AND LIBERTY." ¶ Thanking you in advance for this and all other favours and kindnesses. ¶ We beg to remain, Hon. Sir. Your most Humble Petitioners ¶ The Mosquito Indians and Creoles. About 150,000 ¶ D.M. Ferguson, Representative"
Report & Mosquito petition. D. M. Ferguson, Representative of the Mosquito Indians and Creoles of the Mosquito Reservation of Nicaragua, to British Foreign Minister, p. 6. "Hon. Sir ¶ The Indians and Creoles, (natives) of the Mosquito Reservation of Nicaragua, Central America, have been suffering always from a general unrest which has reached to its climax, and is unbearable. They are like sheep without a shepherd, and are begging and praying for their former British Rule. They are murdered dragged into banditry, suffering from general destruction of properties and live stock. Villages that were inhabited for over one hundred years had been vacated. Their fruit trees destroyed. All these brutalities had been imposed on them by the Spanish speaking population. Portions of their lands are taken and leased to Companies without their consent. They are begging for a direct ruler to see about their rights. I am asked by hundreds of the most prominent men to be their Moses, with the slogan of “Back to the British Flag.” ¶ I am a Britainer who had been laboring among them for several years, and an eye witness to these happenings. I shall communicate with you later through a British Barrister at Law. ¶ Begging you for your prompt and honorable attention to the enclosed petition. ¶ I remain, etc. ¶ (Sd.) D. M. Ferguson"
" [p. 1] . . . LOCATION OF THE ENEMY ELEMENTS. ¶ . . . [NOTE: Of the 14 EDSN chieftains surveyed in the first 4 pages, none were active in the Eastern Area] . . . [p. 5] UNITS IN CONTACT: ¶ [NOTE: Of the 14 military contacts during the month, none were in the Eastern Area] . . . [p. 6] STRENGTH AND MOVEMENTS ¶ . . . [NOTE: Of 12 items in this category, none were reported in the Eastern Area.] ¶ . . . [p. 9] WEEKLY INTELLIGENCE ESTIMATE FOR WEEK ENDING OCTOBER 10. ¶ . . . [p. 10] Entire Eastern Area . . . quiet during week. ¶ . . . [p. 11] . . . WEEK ENDING OCTOBER 17. ¶ . . . [p. 12] Eastern Area and Southern Departments quiet during week. ¶ . . . [p. 13] . . . WEEK ENDING OCTOBER 24. ¶ . . . [p. 14] ESTIMATE. ¶ . . . Eastern Area and Southern Depts. . . . should remain quiet this week. ¶ . . . [p. 15] WEEK ENDING OCTOBER 31. ¶ . . . [p. 16] GENERAL INFORMATION. ¶ . . . Eastern Area has been quiet during week. Area Commander, Eastern Area, reports conditions better than for some time. ¶ . . . [p. 17] ESTIMATE. ¶ . . . Little trouble is expected in the Eastern Area. ¶ . . . [p. 30] CONSOLIDATED REPORT OF CONTACTS OF THE GUARDIA NACIONAL FOR THE MONTH OF SEPTEMBER 1932 [NOTE: Of 14 military contacts, none were in the Eastern Area]." 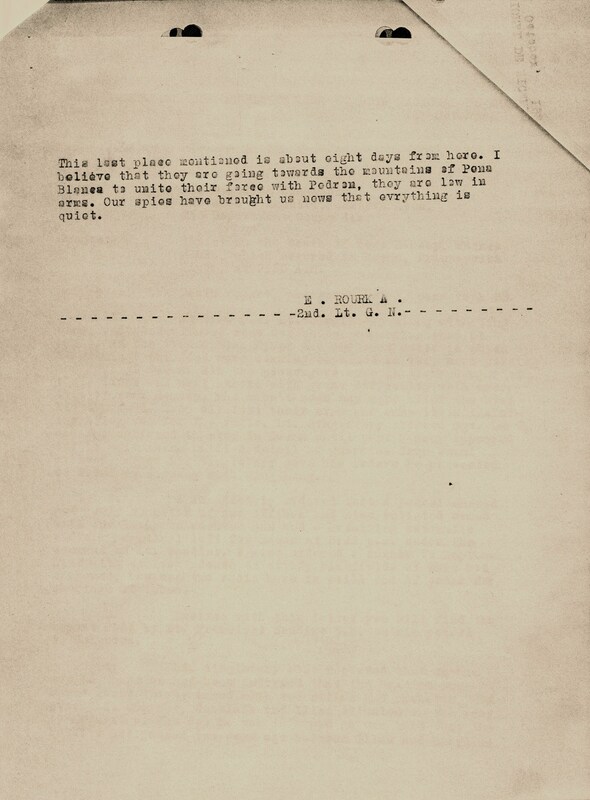 Letter from Rear Admiral C. H. Woodward, Chairman of the U.S. Electoral Mission to Nicaragua, Managua, to Major John Marston, Managua.
" [p. 1] . . . LOCATION OF THE ENEMY ELEMENTS. ¶ . . . [NOTE: Of the 14 EDSN chieftains surveyed in the first 4 pages, none were active in the Eastern Area] . . . [p. 5] UNITS IN CONTACT: ¶ . . . 3 NOV: Cabo [Private] Blandon and Cabo Gracias patrol of 10 enlisted had contact with a group of 60, jefe unknown, at MOKARIN (lower Rio Coco). Fighting lasted one hour. Bandit casualties unknown, but indications of both killed and wounded. No guardia casualties. Guardia captured several boats, baggage, loot and miscellaneous articles. ¶ [NOTE: Of 22 military contacts during the month, one was in the Eastern Area] . . . [p. 7] STRENGTH AND MOVEMENTS ¶ [NOTE: Of 19 items in this category, none were reported in the Eastern Area.] ¶ . . . [p. 10] WEEKLY INTELLIGENCE ESTIMATE FOR WEEK ENDING NOVEMBER 7. ¶ . . . UNITS IN CONTACT DURING WEEK . . . [p. 11] [repeat of above report of Cabo Blandon’s contact, here spelled “MOKARIM”] . . . [p. 13] WEEK ENDING NOVEMBER 14. ¶ . . . [p. 14] Eastern Area very quiet during week. ¶ . . . [p. 15] WEEK ENDING NOVEMBER 21. ¶ . . . [p. 16] Eastern Area reports conditions quiet. ¶ . . . [p.17] WEEK ENDING NOVEMBER 28. ¶ . . . [p. 18] Eastern Area and other Southern Departments should remain quiet. ¶ . 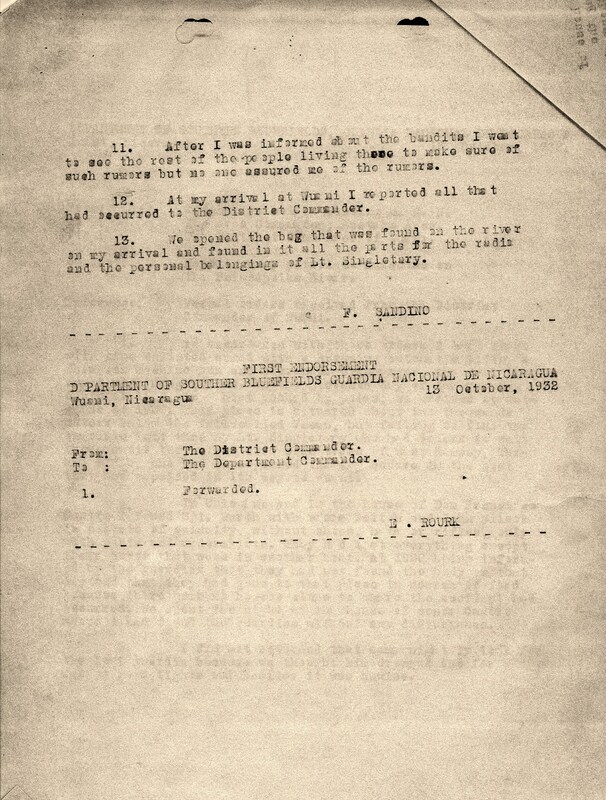 . . [p. 29] CONSOLIDATED REPORT OF CONTACTS OF THE GUARDIA NACIONAL FOR THE MONTH OF NOVEMBER 1932. ¶ . . . 3 NOV: Cabo Blandon, MOKARIN, [captured] boats, loot ¶ [NOTE: Of 22 military contacts in November, one was in the Eastern Area – that of Private (Cabo) Blandón, above; the original report has not been found.]"